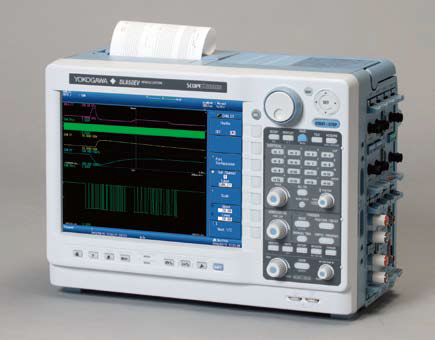 My company has used Yokogawa ScopeCorder for about 15 years starting with the 708 model. My department has pretty much standardized on Yokogawa which allows multiple groups to use and borrow them as needed. 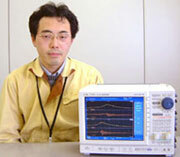 The Yokogawa group have always taken good care of my equipment and instrumentation needs. I have been using the DL750 on some projects and all involved have asked how I am getting such amazing data and good measurements. I always use that opportunity to say it is not me, it is the equipment I use. We develop engines for racing motorcycles. Mainly, I'm in charge of developing measuring systems for engine performance evaluations and reliability tests.We do a variety of different evaluations on the engine test bench. We perform measurements on a regular basis of quite a number of items including the number of engine revolutions, torque, throttle opening, air-to-fuel ratio (A/F) which indicates the condition of the engine, concentrations of exhaust gases, pressure, and temperatures related to the exhaust and engine. We capture all of these signals and perform analysis using the DL750 ScopeCorder and the modular WE7000 PC-Based Measurement Instrument. Our job requires capturing suddenly-occurring abnormal phenomena as the engine turns and then observing the details while at the same time making long-duration observations of slow signals such as the air-to-fuel ratio (A/F). 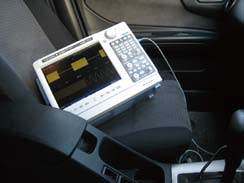 We use the DL750 ScopeCorder for such monitoring applications and measurement of valve behavior during unit testing.The DL750 has a color display which makes it easy to view 16 channels of data at once, and the long memory and zoom functions allow us to observe abnormal phenomena in detail.We also use the snapshot function frequently. It helps us tremendously by letting us freeze a waveform being displayed on screen and save it to MO disk or PC card. The DL750 also has an abundant array of interfaces so it's easy to use, and one reason we chose the DL750 is because of the Ethernet function that allows us to connect it to a network. We've been using DL series digital oscilloscopes for awhile, and we are very satisfied with them because they are easy to use and offer high cost-performance. I work on development for hybrid vehicles. Especially in recent years, I've been involved with the Advanced Clean Energy Vehicle Project (ACE project) at NEDO (New Energy and Industrial Technology Development Organization). The objective of the ACE (Advanced Clean Energy Vehicle) project for 2003 is to work in cooperation with all the automobile manufacturers in order to reduce carbon dioxide emissions by developing new vehicles that combine hybrid structure, greatly decreased fuel consumption, clean energy, and after treatment technology for exhaust gases. At Hino Motors, our goal this year is to come out with a hybrid bus with two times the fuel efficiency compared with our previous heavy duty diesel busses. We brought in five of the DL750 ScopeCorders for development on this new hybrid bus. The bus under development has a new hybrid system and electrical storage units, and we use the DL750s to capture various signals in that system. For the storage unit we capture cell voltage, module voltage, current, temperature and other signals. In the engine we look at RPM, torque, and controller output signals, and in the hybrid system we measure motor, controller, temperature and many other kinds of signals, all of which undergo subsequent analysis. Before, when the project was focused on storage research, we used 10 of the DL716 ScopeCorders to measure voltage. 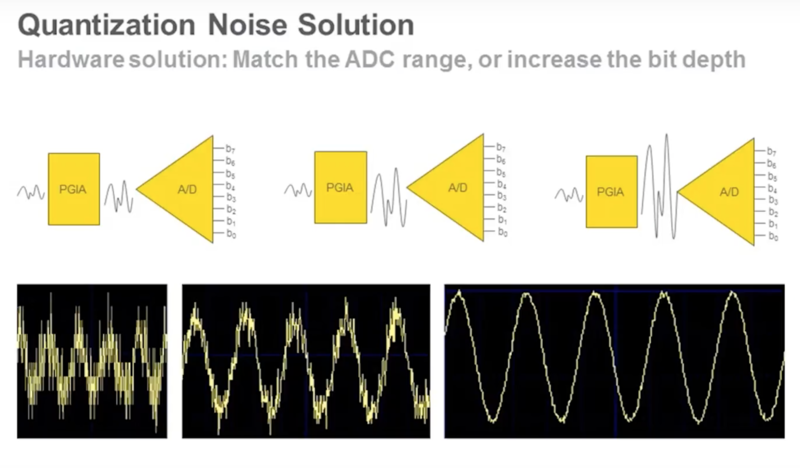 The DL716 accepted 16 channels of isolated input, and the long memory of that oscilloscope gave us high resolution that was really convenient for us. 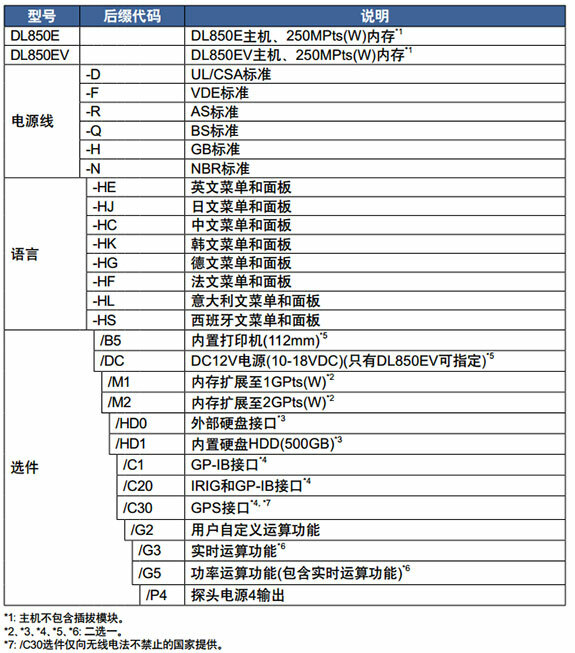 We chose the DL750 this time because it carries over the features of the DL716, but has improved long memory, is smaller in size, and adds GP-IB and Ethernet support which we think will be useful in the future. 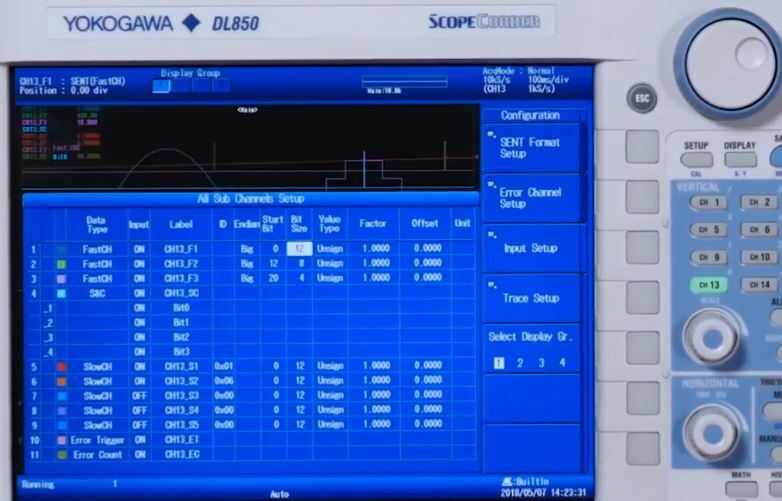 By hooking up the five DL750s to a notebook PC via GP-IB, we can gather all 80 channels worth of data together using our customized LabVIEW software. We can send measurement commands to the DL750 from the PC, and that really speeds up our work. By gathering various kinds of data measured from the actual vehicle, the DL750 helps us understand what's going on inside the hybrid systems as they operate. During development of the new hybrid bus we analyze everything from the measured RPMs at a given accelerator position to the voltage values in the storage unit to energy consumption, and this lets us determine the most fuel-efficient control conditions for the hybrid system. The DL750 is fabulous. We have been using the unit to monitor AC line, investigate Instantaneous Stop conditions and to test live boards. It is safe and easy to operate (if you read the manual or receive technical service assistance). I truly recommend the unit to anyone that is involved in some kind of signal monitoring activity...it is great! I have only used 40% of its capacity more or less, but I am looking forward to squeeze every dollar we invested on it. I rate the unit at # 4 level because I am not familiar with other oscilloscopes similar to the DL750. Thanks. In the development of new engine control strategies we often have the need to capture and analyse many complex signals. 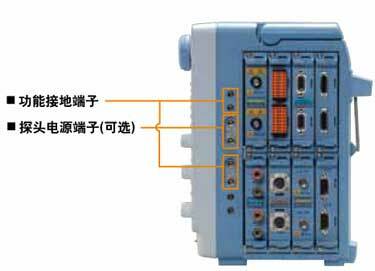 To this end we have several Yokogawa Oscilloscopes including the DL750. The DL750 is an essential tool in our work, being used by engineers for a multitude of tasks: Software design and validation as well as Control system design and calibration. 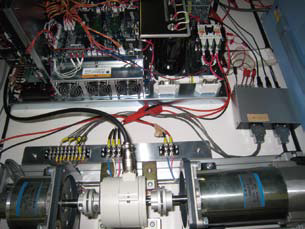 In a recent case, we had a development issue with the control system for an engine actuator. On analysis of the signals within the software calibration tool we were unable to diagnose the issue. It wasn't until we used the DL750 with its high speed signal acquisition and multiple channel capability that we could fully understand what was going on. In engineering, it is the understanding of a system's behavior that is the key to developing solutions. The DL750 gives us a window into the complexity of the signals in our systems. From there we have the means to develop highly refined control systems for our range of class leading diesel engines. This is a powerful troubleshooting tool. It took me a couple of days to figure it out, but it really is versatile and capable of monitoring signals from instrument level all the way up to 480VAC. 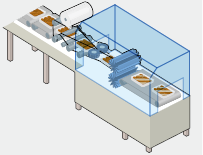 We have already used it to monitor & trend motor currents & frequency on our new production line. We were having troubles with the motor drive tripping, and we found out that the design speed/frequency for the application was estimated wrong from the beginning. We adjusted base frequencies for the product and it is running good now. I have used similar laptop based equipment in the past, which had lots of interface parts & was not very reliable. This thing has everything rolled into one box, and is much more reliable and versatile. We have 2 DL750s. They are easy to setup and use. The channel to channel isolation / cross is one the best unit I have found. There are 2 things that could have been done better. First there is no tilt stand on the bottom. Also, the developers view this as an enhanced scope. So the vertical and horizotal units are always in per division. This is a little bit confusing since I really would like to set the range and not the volt/div * 8 div. Otherwise this is a very nice instrument.